Shaping Cities in an Urban Age, published by art press Phaidon and funded by a nonprofit branch of Deutsche Bank, is a glossy, heavy, image-rich brick of a book. For instance, one stark page is entirely devoted to two statistics: 4.4 gigatons of cement were used by the US in all of the 20th century, vs. 6.5 gigatons of cement used in China just between 2011 and 2013. With abundant graphs, striking photos, and blaring figures like these, the book is useful for visually oriented readers. It’s also targeted at those interested in gaining a sweeping sense of contemporary cities, and contemporary urban issues, around the world. It wouldn’t be out of place on a coffee table or in a design-studio waiting room. 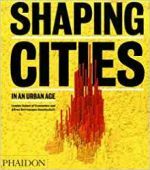 Shaping Cities in an Urban Age forms part of the Urban Age project at the London School of Economics, which has already produced two books. This latest volume is made up of 37 essays by urban thinkers including AbdouMaliq Simone, Susan Parnell, Saskia Sassen and David Satterthwaite. Broad themes are emergence, power, uncertainty, constraints and intervention.